Copies of The New York Daily News on sale in Manhattan, the day after the paper was sold to Tronc, Sept. 5, 2017. Reporters and editors at The Daily News were been told that the newsroom staff was being cut in half and that the editor in chief, Jim Rich, was out of a job on July 23, 2018. Grant Whitmore, an executive at Tronc, the media company that owns The News, presided over the meeting, which took place in its newsroom in Manhattan. The new editor in chief is Robert York, currently the editor and publisher of The Morning Call, a Tronc-owned daily newspaper in Allentown, Pa.
NEW YORK — The meeting lasted less than a minute. By the time it was over, reporters and editors at The New York Daily News had been told that the newsroom staff was being cut in half and that Editor-in-Chief Jim Rich was out of a job. Grant Whitmore, an executive at Tronc, the media company that owns The News, presided over the meeting, which took place shortly after 9 a.m. Monday in the seventh-floor newsroom in lower Manhattan. About 50 members of the newspaper’s staff were in attendance. The group did not include Rich or Kristen Lee, the managing editor, who is leaving as part of Tronc’s aggressive plan. The new editor-in-chief is Robert York, currently the editor and publisher of The Morning Call, a Tronc-owned daily newspaper in Allentown, Pennsylvania. Since Tronc, which is based in Chicago, bought The News from New York real estate developer and media mogul Mortimer B. Zuckerman in September 2017 — for a reported $1 — it has been examining the asset. In a memo sent to the paper’s employees minutes after the quick Monday morning meeting, the company said that it had been working to transform the tabloid into a publication better suited to the digital age. It was not the first time The News had made sweeping cuts. In 2015, under Zuckerman’s ownership, the paper laid off dozens of employees, including virtually its entire digital team. A company that once had hundreds of employees has over the years dwindled to a newsroom staff of approximately 75 to 100. 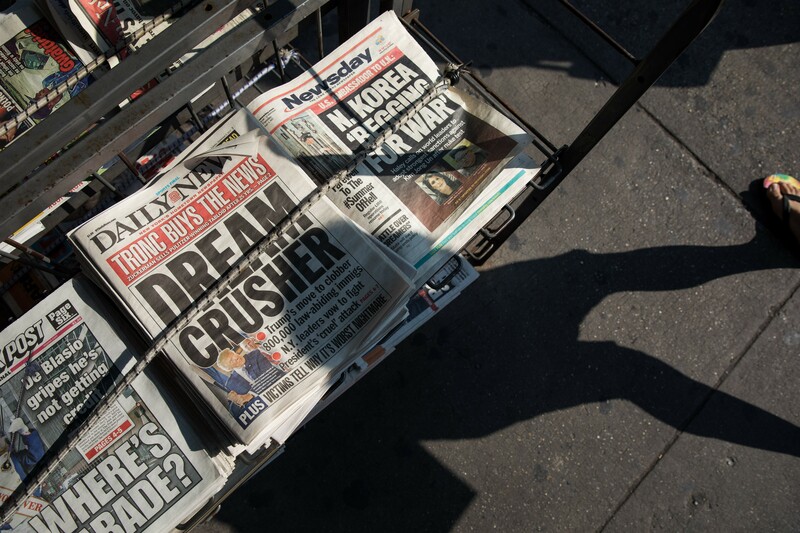 The latest layoffs were yet another blow to the tabloid, which was once a no-nonsense staple publication for New York’s working class and had the highest daily circulation of any newspaper in the country. In 1947, The News boasted a 2.4 million daily circulation, its highest figure. In recent years, its print circulation numbers have fallen to roughly 200,000, while its digital reach over the past year is 23 million.